3/26/10 – “Crazy For You” Doo Wop Cat Fight! The Friday Night Cat Fight Radio Show presents two great versions of the doo wop classic, “Crazy For You” for your consideration this week. This hour long program also contains a tribute to the late Johnny Maestro, a few songs about baseball and spring, songs about ugly and beautiful babies and the vocalese jazz styling of Annie Ross. Plus, you’ll even find a great Elvis rarity in there as well as many other surprises. So listen to the show, vote for your favorite version of “Crazy For You” and have a swinging time. Which One Do You DIG The MOST? - "Crazy For You"
3/12 & 3/19/2010 – Pickett Vs. Burke: Battle Of The Soul Titans! This week’s show also contains the evolution of a Buddy Holly classic, the musical inspirations of Frank Guida AND some Top 40 radio chaos. So listen, vote and dig The Friday Night Cat Fight Radio Show. Which One Do You DIG The Most? - "If You Need Me"
BONUS Cat Fight Poll: Which Of These Is The Cat's Meow? 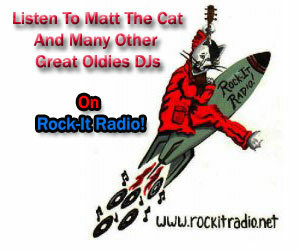 - "Everybody Needs Somebody To Love"
**To receive a complete playlist of this program, please subscribe to Matt The Cat’s email newsletter here. 3/5/10 – History Of “Milk Cow Blues” & More! Do you ever wonder where classic songs come from? I do constantly. That’s a major reason why I’m tracing the interesting history of a true blues and rock n’ roll classic, “Milk Cow Blues.” On this week’s program, I trace this song’s evolution over NINE songs. However, only FIVE of those NINE are in contention in the Friday Night Cat Fight! Please pick your favorite and vote for it. This week’s show also contains a rare record by character actor Jim Backus, one of Ray Charles’ spiritual influences, a tribute to Patsy Cline and a few “notes” on the Beat Generation. Listen, vote and dig, baby! Which One Do You DIG The Most? - "Milk Cow Blues"